Clare Local Action Group been approved almost €9 million in funding under the LEADER Programme 2020. 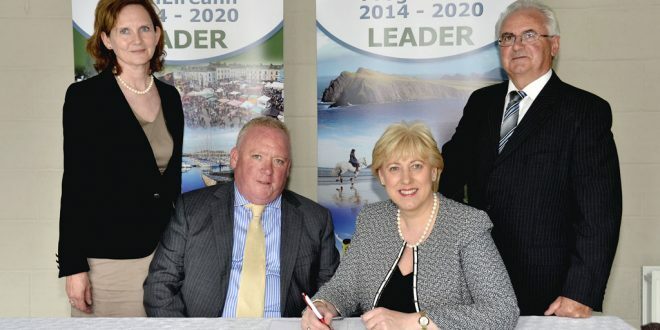 The funding agreement signed by he Minister for Arts, Heritage, Regional, Rural and Gaeltacht Affairs, Heather Humphreys will support jobs and investment in Clare over the next four years. Funding of €250 million will be distributed to entrepreneurs and community groups throughout Ireland by the Local Action Groups, which are made up of public and private representatives. The LEADER programme funds projects under a diverse range of themes that include enterprise development, rural tourism, social inclusion and the environment. Minister Humphreys said, “The LEADER programme will deliver some €250 million into rural towns and villages right across the country over the next four years. By signing the funding agreements with Clare Local Action Group, we are unlocking €8,920,224.65 in vital funding for rural communities across Clare.